The British and Irish Association for Practical Theology is an active forum for practitioners, teachers and researchers in the broad field of practical theology. It was founded in 1994, and has grown through its broad-based networks and successful annual conferences to a membership of nearly four hundred in Britain, Ireland and further afield. 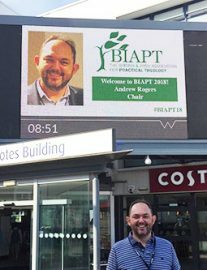 BIAPT is one of the key sponsors of the journal Practical Theology (formerly Contact). Since 2015 BIAPT has also incorporated what was the British and Irish Association for Mission Studies (BIAMS). Those interested in sharing practice, research and reflection on engagement in mission in our local and global contexts are encouraged to join BIAPT and become part of the Mission Studies Special Interest Group. The constitution adopted in July 2018 may be downloaded here.